Jen is the Kaibosh Hutt Operations Manager and has worked for Kaibosh for the last three years. Jen did a brilliant job setting up the Hutt branch in 2015 and its continued success is a testament to her hard work and passion for reducing food poverty and food waste. I am the Operations Manager for Kaibosh Hutt. I was brought onboard in mid 2015 to set up the Hutt branch and am still running the base to this day. Before I started, Kaibosh had done some in-depth research in the Hutt Valley into the need for our service and whether there were food donors who were keen in being involved and found that the answer was ‘yes’. With the excellent processes and good Kaibosh brand well established in the City branch, it was an easy job to roll our a similar service in the Hutt Valley and we opened the Hutt Valley branch in November 2015. I had moved to Wellington with my partner’s job and was looking for work. My sister had made a list of Wellington businesses and organisations that she thought I would like working for and one of those organisations was Kaibosh! We looked through the website and listened to a TEDx talk by Matt and I was really inspired and decided I would definitely contact them. Later that same day, I happened to be talking to Beth Brash, who I found out was on the Kaibosh Board and she told me there was a job going – the Operations Manager’s role in the Hutt – and applications closed that evening! We didn’t even have Internet hooked up at our house yet, so I went to the library and requested the Job Description. I had previously been working as a base logistics manager for Medecins Sans Frontiers (Doctors Without Borders) and the JDs for both roles were almost identical! I got my application in that evening a few minutes before applications closed – and the rest is history! Very serendipitous! What’s one of your stand-out memories of Kaibosh? 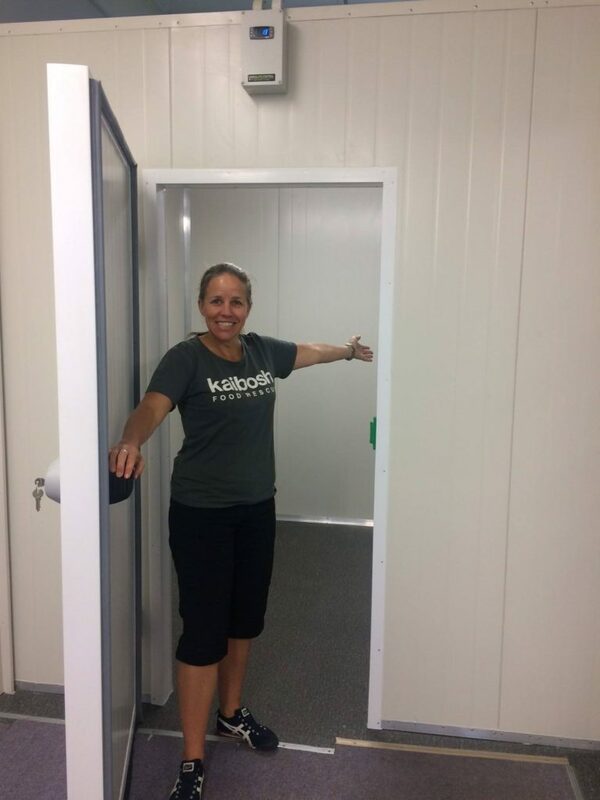 During the week that followed the Kaikoura earthquake in November 2016, Kaibosh in the Hutt was absolutely inundated with food and we all worked together – volunteers, drivers, and other staff – to sort and redistribute it to those in need, particularly those who had been evacuated. During this time, most of the supermarkets closed for a couple of days to clean up and they donated much of the produce and frozen meat they had in the stores, along with items with damaged packaging as a result of falling off shelves. During the week after the quake, Kaibosh Hutt rescued and distributed 4,323kg of food, the equivalent of 12,351 meals. This food was distributed to two marae and a welfare centre who were receiving evacuees and those in need during this time. Meanwhile, our Kaibosh colleagues in the city were going through their own challenges! This photo was taken when the walk-in chiller was newly installed in the Hutt branch in March 2016. When we first opened, we had been working with three stand-up glass-fronted fridges but with the volumes of food coming in, we soon outgrew these, and managed to get funding for a walk-in chiller. It was an awesome moment when we switched it on and it began to chill down, ready for the arrival of the day’s kai!